The 2016 Outlander features more than 100 engineering and design improvements, Mitsubishi says. Mitsubishi Motors North America will unveil the 2016 Outlander at the New York International Auto Show next week as a part of its freshened design lineup. The 2016 re-engineered Outlander will be the first vehicle to show the Mitsubishi brand’s new design language, the company said in a statement. The automaker also released teaser photos of the vehicle. The crossover features more than 100 engineering and design improvements, the statement said. There will not only be a change in “the face of the vehicle, but also a philosophical change,” a Mitsubishi spokesman said. 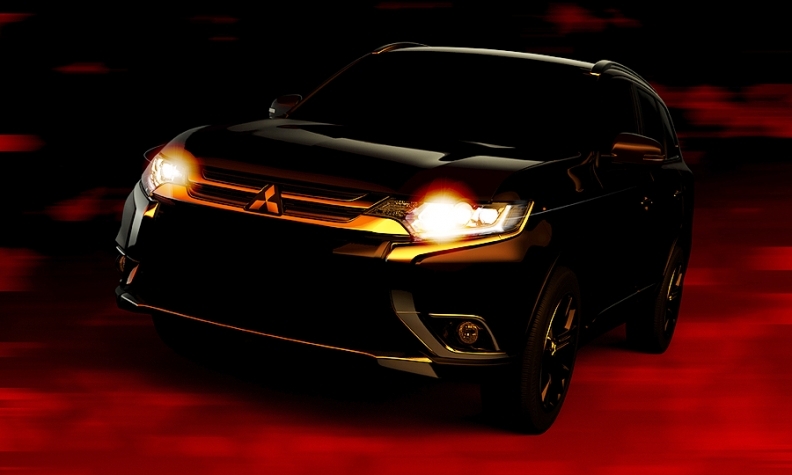 Mitsubishi would not elaborate on the updates until the news conference April 2. The Outlander will have a new grille and fascia, Automotive News reported in 2014 when Mitsubishi announced its design changes. The grille and fascia are two of the new pieces of sheet metal from the A-pillar forward and rear of the C-pillar included in the update. Mitsubishi in February introduced a re-engineered 2015 Outlander Sport with a larger displacement 2.4-liter four-cylinder engine that generates 168 hp, a 20 hp increase compared to the 2.0 liter engine.